Redemptorist Father Jerome Anthony Moody, the first elected Superior of the English-Speaking Region of the Caribbean, died Jan. 22 at Brigham and Women’s Hospital in Boston. He had suffered previous health crises due to heart disease and diabetes and was in residence at Our Lady of Perpetual Help Basilica (Mission Church) Rectory for easier access to medical treatment. He was 59. Funeral plans are pending, with interment to be in the Redemptorist mausoleum at Western Cemetery in St. Thomas, VI, in accordance with his request. Memorial Masses will be offered in St. Thomas and in Dominica, where he has served for several years, including his two terms of office as Caribbean Regional Superior. The son of Freddy Lee Moody and Helen Moody Parris, he was born in Manhattan Dec. 17, 1946. At a young age, he and his three siblings moved with their mother to her home island of St. Thomas, where the children were baptized at Sts. Peter and Paul Cathedral and later attended the parish school. He pursued his studies for the priesthood at St. Mary’s Seminary in North East, PA; St. Alphonsus College in Suffield, CT; and Mount St. Alphonsus in Esopus, NY. He made his first profession as a Redemptorist in 1966 and his final profession in 1969. He was ordained to the priesthood June 25, 1973, at Sts. Peter and Paul Cathedral, becoming the first Redemptorist Virgin Islander to be ordained on his home island. Father Moody’s first assignment was to St. James and St. John in Baltimore where, after six years, he was named pastor. In 1984, he was appointed pastor of his home parish, Sts. Peter and Paul, in St. Thomas. While there, he began to mentor the Virgin Islands’ first two West Indian seminarians for the Diocese of St. Thomas: now Bishop Emeritus Elliott G.. Thomas and Father George Franklin. "He was the one who mentored us through our diaconate year," the bishop said. "Because he was the pastor at Sts. Peter and Paul, he introduced us to pastoral ministry in a helpful and practical way. Some of our classmates from other dioceses just got to paint classrooms over the summer, but we visited the sick and sat in on pastoral council meetings. He showed us what it’s like to be a parish priest." Bishop Thomas added that the two kept in touch through the years and visited in Boston just last month. One of the qualities the people on St. Thomas especially appreciated about Father Moody was his preaching ability and his next assignment, in 1987, was to serve as a full-time mission preacher throughout the Caribbean. His home base was at St. Patrick Church in Frederiksted, St. Croix. While his primary assignment remained in preaching missions and retreats, he was later assigned to residence at Our Lady of Fair Haven Cathedral in Roseau, Dominica, where he also was given responsibility for the radio broadcast of "Voice of the Islands." In 1989, he was chosen to serve as pastor of St. Patrick Church in Grand Bay, Dominica. In addition to his pastoral duties, which extended to mission chapels, he put his energy into repairing the parish church, appealing to friends in the Virgin Islands to help with the project. While work on the church progressed, he himself was living in a rectory with no screens on the windows, according to a longtime friend, Father Frank Skelly. The lack of screens was more than a nuisance because the mosquitos which are plentiful in the region carry dengue, also known as "bone-wrack," fever. Father Moody went on to serve as director of Holy Redeemer Retreat House in Eggleston, Dominica, which not only served the needs of Dominicans but also of other groups of Catholics from around the Caribbean. He also developed and headed the Family Life Center for the Diocese of Roseau. He searched out materials on any subject that affected family life in Dominica. His sister Freddie Mae Moody Poole and her husband, Eugene Poole, who work in the marriage preparation ministry for the Archdiocese of Washington, provided material for preparing couples for marriage; a friend from St. Thomas, Dr. Alice Hamilton, founder of the Women’s Resource Center, presented a workshop on domestic violence. Much of his work there involved counseling and spiritual direction. Throughout his ministry in the Caribbean, he dreamed of and worked for the establishment of a Caribbean Region of the Baltimore Province. 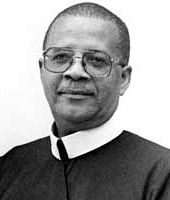 The establishment of the Region, including Dominica, St. Lucia and St. Croix, was approved in 1999 and Father Moody was elected and reelected Regional Superior. Father Rodney Olive, a St. Thomian who served with him for two terms as Regional Vicar, said: "We shared the dream together and, when the time was ripe, we fought for it." Father Moody, he said, "was the most creative idea person I’ve ever known." He spoke of his confrere’s "passion and commitment" to the ministry. "He was a very caring person and he lived on the cutting edge of life," he said. Bishop Gabriel Malzaire of Roseau said that, during his tenure, Father Moody’s "main focus was on the Secretariat of Family Life, but he also served with the Office for Developing and Implementing the Diocesan Pastoral Plan." The bishop added that the Redemptorist was very supportive of his plans for the diocese and he appreciated the fact that "he was always ready to share new ideas with me." Boston’s Archbishop Sean O’Malley, formerly Bishop of St. Thomas, spoke of Father Moody’s dedication to the Redemptorist charism of preaching. "I feel the loss of the Redemptorist family and all the people of St. Thomas and Dominica and the many places where his ministry meant so much," he said. "He was a very gifted priest who generously shared his talents, bringing joy and grace into the lives of so many." It was during his years as Regional Superior that problems with severe heart disease, compounded by diabetes, took a heavy toll. Father Kevin Moley, former Baltimore Provincial Superior, said: "I was in contact with him at different moments in his crises with health. He had confidence in me and I had confidence in him…. I saw the frailties of his heart and when I would see him, he was always appreciative. He was transparent with me; there were no airs about him." He added that for him, as a Provincial Superior, it was very easy to deal with Father Moody as a Regional Superior. "He was a good man, a good priest. He was respectful, intelligent and he wanted the well-being of everyone, especially in the Region," he said. One of Father Moody’s major concerns was with promoting Redemptorist vocations in the Region and he pushed for the establishment of the Blessed Peter Donders Residence in St. Croix to serve as a formation house and an academic bridge for candidates to prepare for entry to St. John’s University in New York. Brother Gerard St. Hilaire of Dominica is one of the men whose vocation he nurtured, just as he had much earlier in Baltimore with Father Kenneth Gaddy, who went on to serve with him in the Caribbean. Father Gaddy said Father Moody’s dedication to the welfare of the community was inspiring. "His involvement with different organizations put us in the forefront, with restoration projects, community services. He even did an ecumenical outreach." His characteristic concern for others was a trait he developed early, according to Mrs. Moody-Poole. "He was my protector; I could talk to him about anything," she said. She recalled how, when he was in the eighth grade, he got a part-time job — which he kept during the summers of his seminary years — to help out the family. "He bought my sister and me our first dolls," she recalled. "He was my big brother and I respected his opinion. He looked out for us; made sure we did our homework; helped cook." When it was time for her to pursue her studies in microbiology, he was the one who supported her in her desire to attend the Catholic University of Puerto Rico which offered the courses she wanted, she added. "He had great sensitivity of soul," Father Skelly said. "He was a dreamer; he enjoyed poetry and music when we were in the seminary," he added. "He was a great preacher and he gave a mission at our place in the Bronx in the 1990s. He had a way of capturing people and engaging people with their faith." Throughout his life, Father Moody kept in touch with friends, from childhood, from seminary, from his ministry. As such a friend himself, Father Skelly said: "He was a very loyal person"
Father Moody is survived by his mother, Mrs. Parris; his sisters, Mrs. Moody-Poole and Mrs. Lynda Brown; two brothers-in-law, Eugene Poole and Alvin Brown; a nephew, Alvin M. Brown; five nieces, Michelle Nielsen, Natasha and Anissa Moody, Kishma and Raquesha Brown; and several grandnieces and -nephews. He is predeceased by his father, Freddy Lee Moody, and his brother, Leonard Moody.